Black Warrior Riverkeeper’s mission is to protect and restore the Black Warrior River and its tributaries. We are a citizen-based nonprofit organization dedicated to improving water quality, habitat, recreation, and public health throughout our patrol area, the Black Warrior River watershed. This vital river basin is entirely contained within Alabama, America’s leading state for freshwater biodiversity. Patrolling waterways, educating the public, and holding polluters accountable has made us an important proponent of clean water throughout the basin. Our staff identifies and addresses pollution problems while increasing public awareness. We are a proud member of Waterkeeper Alliance. Please contact us to report pollution and to inquire about volunteer projects, donations, educational presentations, or public events. The Black Warrior River drains parts of 17 Alabama counties. The area the river drains, its watershed, covers 6,276 square miles in Alabama and measures roughly 300 miles from top to bottom. 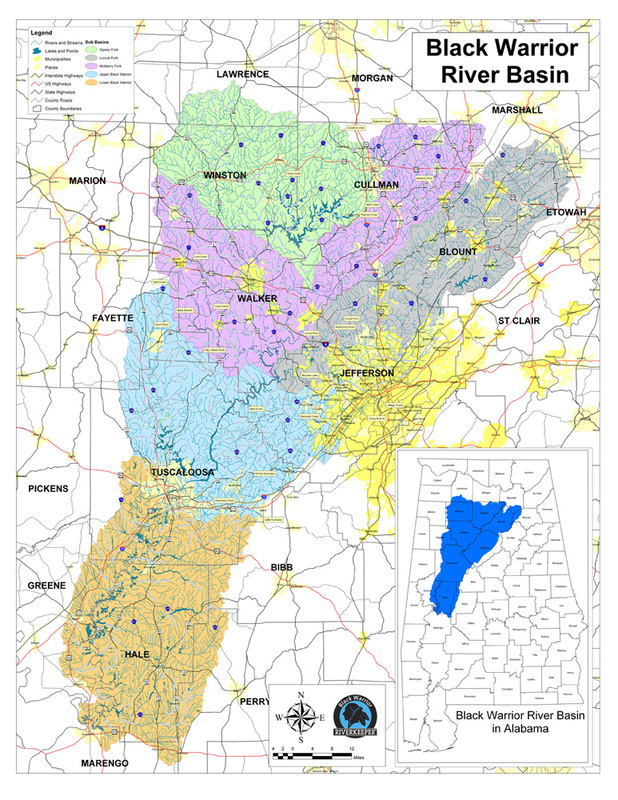 The Black Warrior River watershed is home to over 1 million residents and contains 16,145.89 miles of mapped streams. Its headwaters consist of the Sipsey, Mulberry, and Locust Forks. Once these rivers merge west of Birmingham, the Black Warrior River proper forms the border of Jefferson and Walker counties. Near Tuscaloosa, the river flows out of the rocky Cumberland Plateau and enters the sandy East Gulf Coastal Plain, forming the border of Greene and Hale counties in the Black Belt. At Demopolis the Black Warrior flows into the Tombigbee River towards Mobile Bay.